Agents! Be on full alert! What do you think Herb is up to now? Herbie`s going to waddle in CP! He will be new mascot. 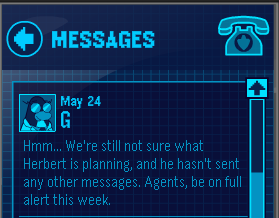 Id I`m right, then Herb will be in CP after new field op! He's going to attack. Let's have some fun, shall we? Lol wut! Herbert iz soooo weak. Guess who beat him over 50 times? My pengy New Year. Come see mee on Frozen In the Gift shop!! BAI NOW!